The only thing constant in football is change. As managers and coaches tweak their tactics and systems to get the best out of their players, they end up forming a new system or formation which when used effectively could produce amazing results and discover a winning formula. I’ve decided to take a look at the some of the famous formations that were successfully used by managers in Europe over the past two decades or so. Ever since Pep Guardiola’s Barcelona perfected the 4-3-3 system, many teams around the world have tried to do the same with varying amounts of success. The new formation that is making the headlines in modern football is the 4-4-2 diamond formation. This formation was used effectively by Brendan Rodgers’ Liverpool team last season. What makes it so likeable and successful for modern day managers is that they can now play two strikers up front without having to shun one of the strikers out wide. Gone are the days when teams used to play a flat 4-4–2 formation. This system was particularly popular in Italy in the 1980’s and early 1990’s. AC Milan team coached by Arrigo Sacchi and later Fabio Capello, went on to win three European Cups, two Intercontinental Cups, and three UEFA Super Cup’s between 1988 and 1995 using a solid 4-4-2 formation. Fabio Capello was in fact so dependent on this system that he used the same approach with the England side that he managed at the 2010 World Cup. Fabio Capello used the flat 4-4-2 formation to perfection with AC Milan but it wasn’t so fruitful with the Three Lions. Also gone are the days are the days when teams play the 4-4-1-1 system with one of the strikers or attacking midfielders playing “in the hole” or operating just behind the main striker. The 4-4-1-1 system was effectively used by the current England manager Roy Hodgson in the 2009-10 season when he managed Fulham as they went on a dream run and reached the final of the 2010 Europa League battling against all odds. They were tough to break down, well organised and stifled some European giants doing so. With the advent of modern football and with so much pace in the game most of the teams prefer playing a 4-5-1 formation or a 4-3-3 formation nowadays. A 4-5-1 formation can easily be changed into a 4-3-3 formation during the game and vice versa. The 4-3-3 formation was very effectively used by Pep Guardiola’s all conquering Barcelona side. They had a very good holding midfielder in the form of Sergio Busquets. The two mid-fielders playing just ahead of Busquets and the two wingers would go forward to support the striker at every opportunity they got. The full-backs were also given the license to bomb forward at every opportunity, thus making this a very effective formation to play the possession based football that Barcelona love playing. The 4-5-1 formation gives a little more defensive stability than the 4-3-3 system and helps teams playing this formation to absorb pressure and hit teams on the counter with the pace in the team. Pep Guardiola’s Barcelona were unstoppable with the 4-3-3 formation that they used. Pep was called a master tactician for perfecting the 4-3-3 system with his all-conquering Barcelona team. His philosophy and system have since then been used by many other teams around the world. Another tactician who has been getting some recognition in football is Liverpool’s Brendan Rodgers. He had the impossible task of playing both Suarez and Sturridge up front last seaon without shunning one of them out wide. He had to do so without compromising the team’s stability. That’s when he came up with this relatively new system called the 4-4-2 diamond formation. 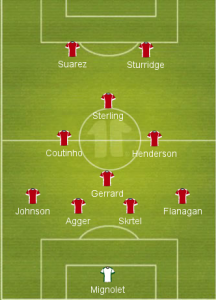 Last season Brendan Rodgers and Liverpool took the world by storm by playing a relatively unknown diamond formation. He probably stumbled across this system because he had to acoomodate two world class strikers in the form of Luis Suarez and Daniel Sturridge in his team. But that doesn’t matter because it was the work of a genius. The football that Liverpool played last season when they used the diamond formation was so refreshing to see and almost propelled them from top 4 contenders to title contenders to losing out on the league title by 2 points. This formation is being used extensively by managers all over the world now. The 4-4-2 diamond has a flat back four like any other formation that has four defenders at the back. Then it has a defensive midfielder playing at the base of the diamond and two centre-midfielders playing on either side of the defensive midfielder. The diamond is completed by an attacking midfielder who plays at the tip of the diamond behind the pair of strikers. This system was used very effectively by Liverpool boss Rodgers last season. Brendan Rodgers had to accommodate two world-class centre forwards in Luis Suarez and Daniel Sturridge and did so by adapting the 4-4-2 diamond formation. Liverpool were very successful using this formation during the title run-in as they won 11 out of their last 14 games and went from 4th-place challengers to almost clinching the title from Manchester City’s grasp. This Liverpool team played with a lot of flair and it was a treat to watch Sturridge and Suarez operate together and torment opposition defenders. With Suarez now gone and Balotelli coming in, Rodgers has the same headache again. He has two top quality centre forwards and he can’t afford to leave either one of them on the bench. The Reds’ defence has to be a lot stronger than last season if Liverpool are to challenge for the title again. 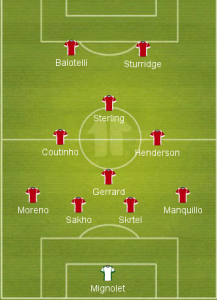 This would mean Rodgers has to go back to using the 4-4-2 diamond system that worked so well for the Reds last season. Most of the center-back pairings in the Premier League would be really comfortable marking just one striker up front. But they would really have to defend out of their skins if they want to keep two top class centre-forwards in the form of Daniel Sturridge and Mario Balotelli quiet throughout the game. Brendan would surely be looking to unleash the duo on Premier League defences, if, of course, Sturridge can get fit and quick. For those of you who, like me, want to know about the different teams that have experimented with the diamond formation, here’s a very good article on ESPN’s website by the extremely knowledgable Michael Cox. It tells you about the different teams that have tried this diamond formation. While most of the teams have been successful, some of them have been unsuccessful too. Brendan Rodgers surely doesn’t have to be reminded as to how kind the diamond formation was for him last season. Just remember “diamonds are rorever”, Brendan.